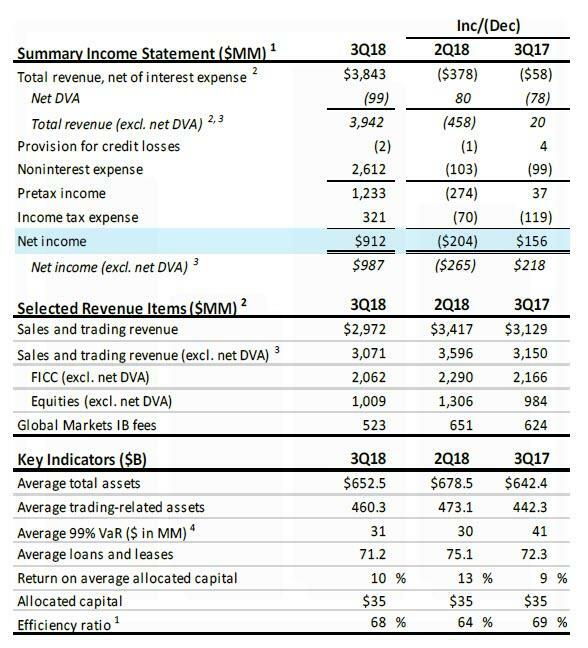 Following in the footsteps of JPMorgan on Friday, moments ago Bank of America reported revenue and earnings that beat expectations, with $22.8BN and $0.66 in Q3 revenue and EPS, both above consensus estimates of $22.67BN and $0.62, even as the bank missed on trading, reporting Q3 trading revenue of $3.1BN, below the $3.15BN expected, as equities generated $1.0BN (exp. $1.06BN) while FICC brought in $2.1BN, just above the $2.08BN expected. Just like Jamie Dimon before him, BofA CEO has upbeat comments about the economy, noting "... a solid U.S. economy and a healthy U.S. consumer." 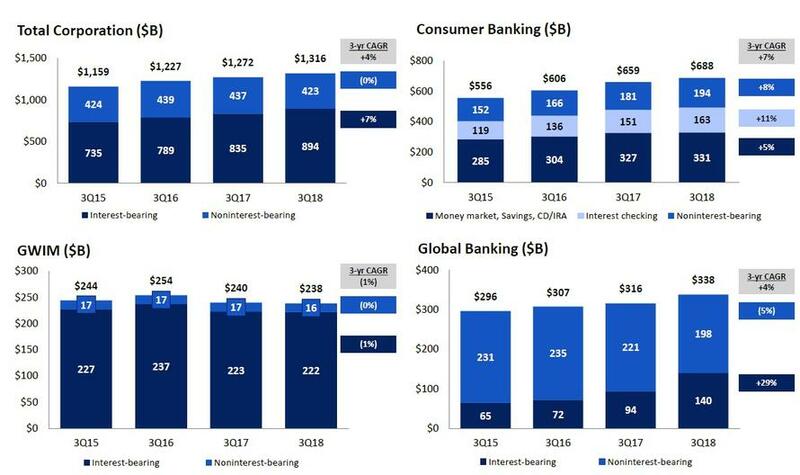 Indeed, as shown below, consumer lending grew by 6% while the net charge-off ratio was at its lowest in nearly 10 years amid improvement in consumer real estate and energy loan performance, a continuation of the trend observed last week from JPMorgan, Citi and Wells. 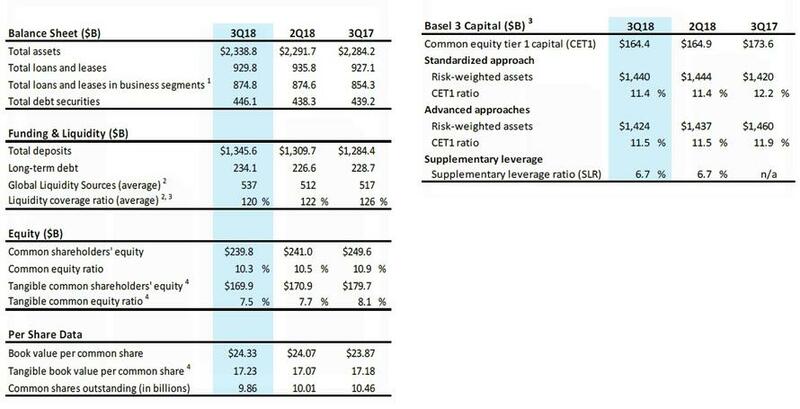 Among the other highlights from the quarter, return on average equity was 11%; return on average assets 1.23%; Basel III common equity Tier 1 ratio fully phased-in, advanced approach 11.4%, estimate 11.4%; provision for credit losses $700 million, estimate $969.1 million. 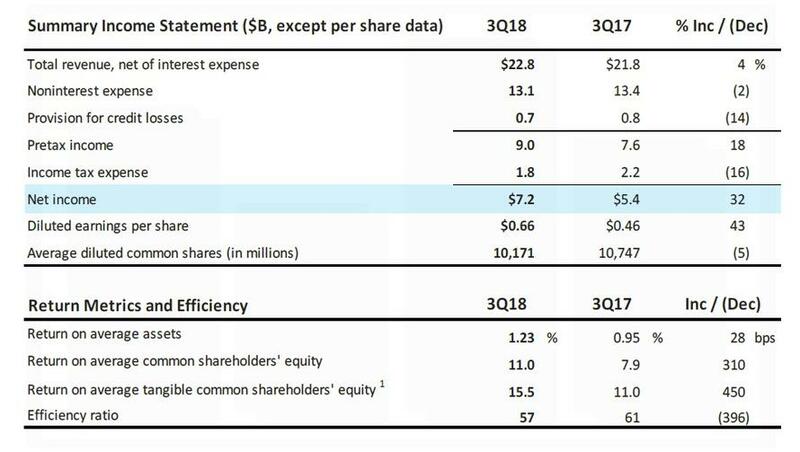 Net interest income disappointed, up 6% to $11.9 billion ($12.0BN on a fully-taxable basis), the highest since 2011, but just shy of consensus estimates which was looking for $12.05 billion for the quarter. The net interest yield of 2.42% increased 6 bps from 3Q17, reflecting the benefits from spread improvement, partially offset by the impact of an increase in lower-yielding Global Markets assets. Excluding Global Markets, the net interest yield was 2.96%, up 13 bps from 3Q17. On the other hand, BofA said it remain positioned for NII to benefit as rates move higher, and disclosed that a +100 bps parallel shift in interest rate yield curve is estimated to benefit NII by $2.9B over the next 12 months, driven primarily by sensitivity to short-end interest rates. 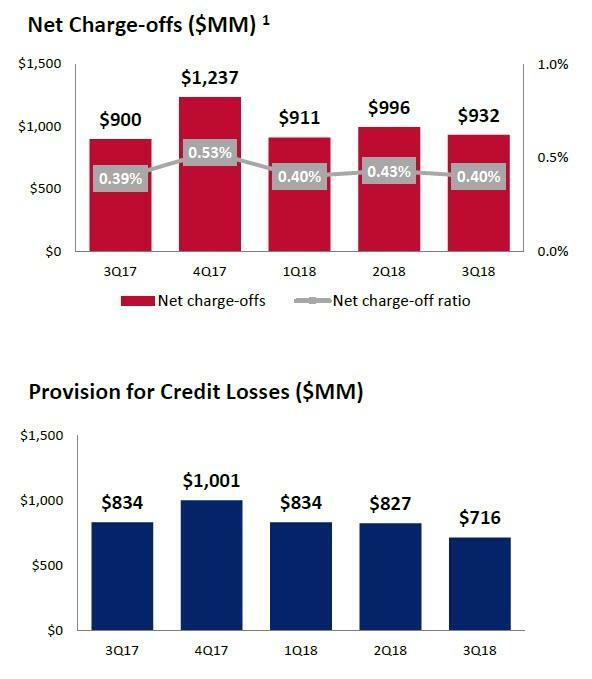 The modest NIM weakness was offset by BofA's decline in provision for credit losses, which was down $118MM, at $716MM, below last year's $834MM and also below the $969MM expected by analysts. The decline echoes the trend observed at both JPM, Citi and Wells Fargo last week. Looking deeper into BofA's balance sheet, the allowance for loan and lease losses of $9.7B, represented 1.05% of total loans and leases. Nonperforming loans (NPLs) decreased $743MM from 2Q18, driven by improvements in both consumer and commercial. Commercial reservable criticized utilized exposure decreased $760MM from 2Q18. 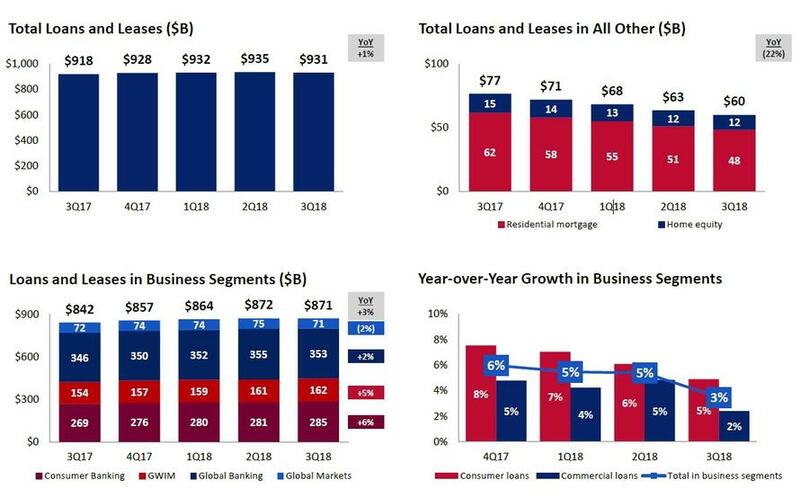 While the quality of the balance sheet generally improved, BofA posted a modest decline in Loans and Leases, which declined from $935MM to $931MM sequentially into Q3, while Loans in Business Segments declined by $1MM sequentially. Meanwhile, deposits continued to rise across Consumer Banking and Global Banking, but declined modestly in wealth management. On the expense side of things, non-interest expenses were down about 2% to $13.1 billion during the quarter "due to broad-based improvements in both personnel and non-personnel expense." 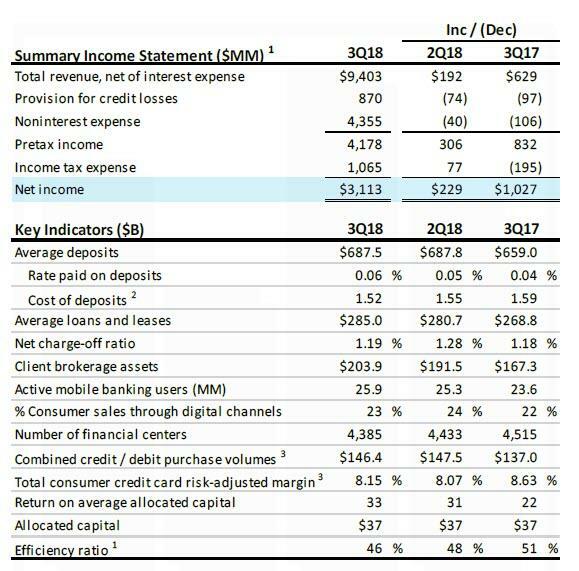 As Bloomberg reminds us, BofA is targeting $53 billion in expenses for the year and it was on track to reach that goal as of the second quarter. 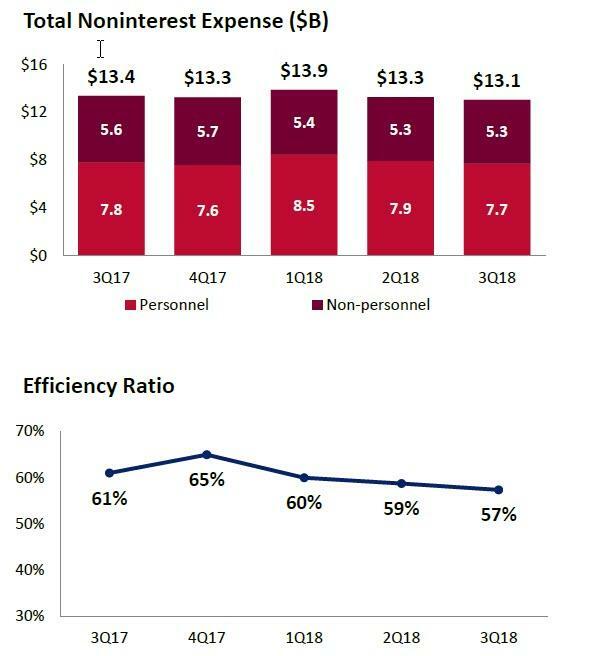 Additionally, BofA's efficiency ratio improved to 57% in 3Q18; total headcount of 205K declined 2% from 3Q17, reflecting declines in non-sales professionals as well as continued investments in primary sales professionals across Consumer Banking, GWIM and Global Banking. Bank of America also highlighted that it has opened 53 new branches and renovated 404 others in the last year. Still, the number of branches overall is down 130 to 4,385 over the past year. Looking at BofA's trading performance in Q3, it was a somewhat mixed picture, with total sales and trading revenue of $3.1BN, (ex. net DVA) down 3% from a year ago, and missing consensus estimates of $3.15BN as equities generated $1.0BN (exp. $1.06BN), down 3% Y/Y, while FICC brought in $2.1BN, down 5% Y/Y and just above the $2.08BN expected. 3Q Investment Banking Revenue of $1.20BN also missed the estimate of $1.33BN. Explaining the decline, BofA said that the 5% drop in FICC was due primarily to lower client activity in rates products as well as a weaker environment for municipal bonds. Meanwhile, equity revenue increase of 3% was driven by increased client activity in financing. BofA's IB revenue downtick seems to have come in worse than expected. Decline being mainly pinned on M&A advisory fees and leveraged finance. Equity underwriting was a bit of a bright spot. What analysts didn't really expect was how bad debt-underwriting revenue would be: $684 million, compared with an average estimate of $820 million. That said, as Bloomberg reminds us, this was the quarter that BofA said investment-banking head Christian Meissner is departing, and there have been rumblings about a lot of movement in the senior ranks. Still, the $1.25 billion in IB revenue is a good bit below the average estimate of $1.33 billion. 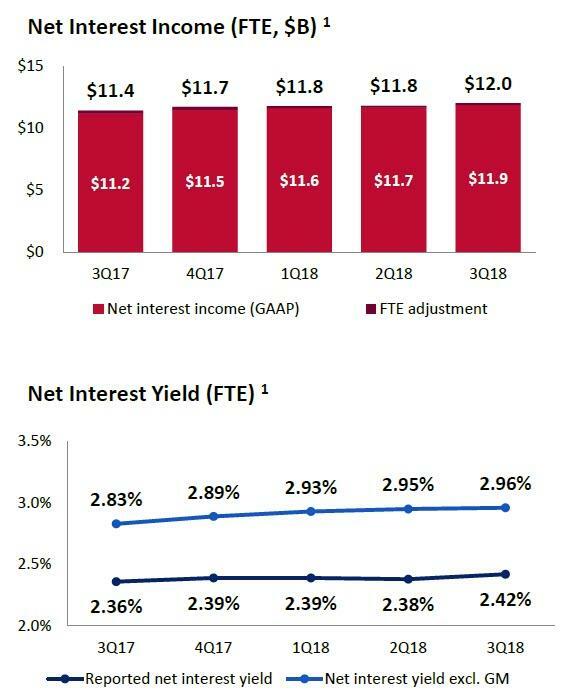 In consumer banking, BofA like other banks, was hit by rising rates and noninterest income decreased modestly, as higher card income and service charges were more than offset by lower mortgage banking income. Looking at BofA's results overall, it was another solid quarter in line with other banks, with the unexpected decline in credit loss provisions indicating optimism about the future even in a time of rising rates, while the miss in trading results will be largely forgiven as it was in line with what other banks reported. The stock was down initially on the results but has since bounced back.